Hell's pond of kiyozaemon(清佐衛門地獄池) is a spring located in Ashigara. It only one in Kanagawa which is chosen as new 100 best water in Japan. There are many flowers for all season. 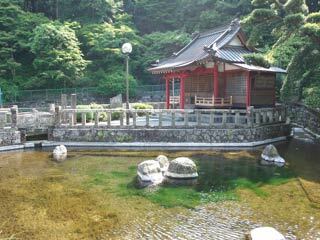 The shrine is Benzaiten Shrine, the god of spring and water. Legend said, in old time, there is guy named Kiyozaemon. He was looking for a good water around here. Suddenly, he was sink under ground with his house. After that, from the spots where he was dropped, water start springing.